Award winning cotton farmer Frans Khambi Malela started farming with cotton in 2001. How long does it take to make a dream come true? Sometimes, it can happen overnight, or in the case of Frans Khambi Malela, at least a quarter-century. If you’re willing to put in the effort and hard work, however, you will eventually reap the benefits of your labour. Malela, from Marble Hall in the south of Limpopo, originally qualified as an electrician. However, he always had a burning desire to follow in the agricultural footsteps of his father. He ran his own electrical business for 25 years until he decided to farm full-time. Today he is an award-winning cotton farmer. It all started when his parents were given four hectares on tribal property by the Goshi in the Matlereteng (Loskop) area. Having worked for his father on the smallholding, he gained valuable farming experience. Later his father became a water warden at the Loskop Dam, an invaluable asset to farmers in the region. At the time, Malela was just a young man and, like many others, later left for Johannesburg to seek a way of making money to fulfil his dreams of becoming a farmer. While his friends ventured into other fields, Malela opted to buy a tractor to plough the tribal land his parents owned. He purchased his first tractor in 1984 and farmed during weekends. Malela won various awards over the years. In 1999 he won Farmer of the Year (in the Maize Category) from the Mpumalanga Department of Agriculture. He also scooped the Small-scale Producer of the Year award in 2007. 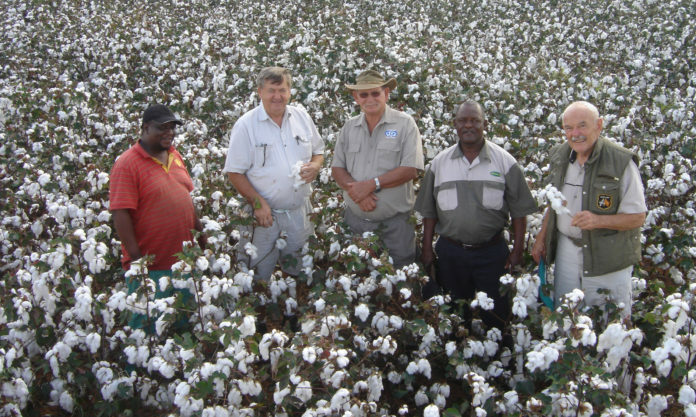 Having originally produced maize for some years, he built up valuable experience, but his life changed when, during 1999, Percy Macaskill of DeltaPine and Samuel Poto of Limpopo’s agricultural department held workshops on cotton production in the area. 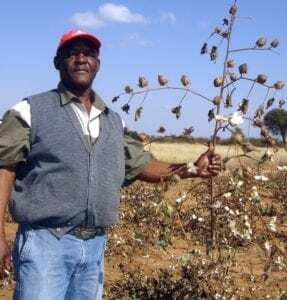 Inspired by the workshops, Malela decided to plant six hectares of cotton in 2001. By merely listening and taking home information material that he received at farmers’ information days held by Cotton SA and other institutions, this new cotton farmer planted and managed the crop to the tee. Macaskill visited his crops and instructed him to thin it out in order to get better results. He made use of the advice and in the end, he produced 995kg/ha – almost one ton, which was 90% higher than the national average for that year. Due to the intense heat during that summer, his maize crop was lost to drought. Luckily, Malela made a special effort to manage his input costs well and made a small profit out of his cotton crop. He moved ahead by planting ten hectares, then 15. He currently produces on 42 hectares – 34 of his own and four hectares each of two friends, Hendrik Makgotla and Maria Swele, who he is training. Under the terms of the tribal authority, Malela owns only five hectares of the land, but rents land from different individuals to increase his profitability and the feasibility area on which to produce cotton. Malela (right) and Jannie Terblanche a Loskop cotton farmer and mentor. Malela’s cotton is delivered to the Loskop Cotton ginnery outside Marble Hall. In addition, he found an ingenious way of mixing manure with his fertilizer to save costs, but with good results. However, success does not come easy, and Malela faced problems which had a negative effect on his crops, including fencing theft. The fences are often taken down to be used around the perpetrator’s home or to let cattle in to graze in the cotton fields. Today, Malela is a member of the Tsoga Milomi Farmers’ Association. He holds information days on his farm to promote cotton production in the area. He even goes as far as using his own tractor to help neighbouring farmers plough and spray against pests, often without getting immediate cash for his efforts. He is willing to help until such time as the farmer is in full production. 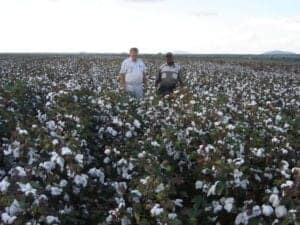 Throughout his journey in building his farming business Malela was supported by Cotton SA, Limpopo’s Department of Agriculture, Qwamico and Omnia with advice and assistance, where necessary. Cotton facts: Be sure not to confuse your “cotton gin” with your favourite booze. In this context, “gin” is simply the shortened version of “engine” – the super duper machine that removes cotton fibre from cotton seeds. Click here to read more cool cotton facts.